Parkinson’s disease is the second most common neurodegenerative disorder, and patients experience primarily movement-related symptoms including shaking and rigidity in their limbs, slow movements, and difficulty walking, all of which progressively worsen over time. It was formally recognized as a disease in 18171, but didn’t receive much attention until it was given its name in 1861. Parkinson’s disease was not very well understood, and there were no real treatments for about 100 years. Then, in the 1960s researchers discovered that Parkinson’s patients had low levels of dopamine, a chemical in the brain that some neurons use for communication. This finding led to the use of L-Dopa (also known as levodopa) as a treatment. L-Dopa is taken orally and can reach the brain, where it is converted to dopamine2. 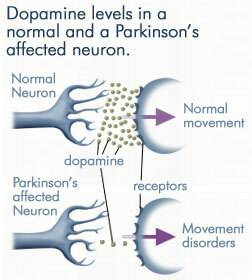 Now approximately 40 years later, L-Dopa is still the primary treatment for Parkinson’s disease. The problem is that L-Dopa doesn’t work forever. Since the 1960s, we have learned that Parkinson’s disease is caused by progressive damage and eventual loss of dopaminergic (DA) neurons (these are the ones that release the dopamine), most severely in an area of the brain important for movement known as the basal ganglia3. As more and more DA neurons become damaged and die off, L-Dopa loses its ability to compensate and the symptoms start to come back. To make matters worse, L-Dopa has a number of side effects that need to be treated with yet more drugs. Of course, L-Dopa is currently very necessary for treating Parkinson’s disease and can give patients an extra 5-15 years of quality symptom-free life. Even as L-Dopa’s effectiveness begins to decrease, it’s still better than no treatment at all. But newer and better treatments need to be developed. Unfortunately, we can’t fix the disease until we understand what’s causing it. Why are the DA neurons dying? How can we stop it and then reverse the damage? We’ve learned just about everything we can from (ethical) research in humans. It’s time to bring in the model animals! The humble fruit fly Drosophila melanogaster has emerged as a particularly important model because while most cases of Parkinson’s disease occur randomly, about 10-15% of cases are due to inherited genetic mutations. And for genetic research, flies are our best bet. Why study the genetic mutations if only 10-15% of cases are caused by them? The easiest answer is because we can introduce mutations into the same genes in fruit flies to find out what those genes do. If researchers can figure out what’s causing damage to the DA neurons in the genetic cases, those findings can be directly applied to the random cases. So even if we don’t yet know what caused them, treatments that protect DA neurons and compensate for their damage should still work to improve symptoms in both genetic and random cases of Parkinson’s disease. Since the late 1990s, mutations in five genes have been found to lead to inherited forms of Parkinson’s disease in some families. Each was given a cryptic name: SNCA4, Parkin5, PINK16, DJ-17, and LRRK28-9. Once those genes were identified in human patients, researchers were able to mutate the same genes in animal models to figure out what they do and how their failure leads to Parkinson’s disease. Luckily for us, fruit flies already have four of those genes, so it was relatively easy to make a fly line with a mutation in them. The remaining gene, SNCA, can still be studied by introducing the human mutation into flies using a binary expression system (UAS/GAL4). So what have we learned so far from our winged friends? An overview of fruit fly research for each gene is listed below, but if you just want the punchline, here it is: Parkin, PINK1, DJ-1, and LRRK2 are all involved in maintaining and/or protecting mitochondria, which are structures inside cells that create the fuel the cell uses as energy (think of them as little power plants). When any of these four genes is mutated, mitochondria begin to function abnormally and are more sensitive to damage from environmental stressors such as toxins. As more and more damage accumulates, DA neurons begin to die off, which may explain why Parkinson’s disease is progressive and usually begins later in life. On the other hand, although the role of normal SNCA is still unknown, a mutated SNCA gene creates masses in the brain called Lewy bodies that may cause damage to DA neurons. Although it’s not fully understood why mutations in these genes affect DA neurons more severely than other neurons in the brain, it is thought that DA neurons may simply be more sensitive to environmental toxins. Okay, but what about the random cases? While the cause of most of the random cases of Parkinson’s disease remains a mystery, results from research in the genetic cases can give us a clue. It is currently thought that this form of Parkinson’s disease is caused by a combination of factors such as accumulated damage and genetic mutations with age, exposure to environmental toxins such as pesticides, and genetic predisposition (meaning that there may be genes that don’t directly cause Parkinson’s disease, but may increase your risk if exposed to certain environmental triggers). Research in fruit flies has definitely improved our understanding of the underlying causes of Parkinson’s disease, which will ultimately lead to the development of better treatments. Instead of simply compensating for reduced dopamine levels, future treatments may target the Lewy bodies or bolster the cell’s protective mechanisms for mitochondria. Treatments such as these will have longer lasting effects because they could potentially prevent further loss of DA neurons. And fruit flies aren’t our only hope. Many of the findings described above have already been used for designing studies in mammalian models, and research in mammals has also led to important discoveries not mentioned here. Parkin/PINK1: I grouped these two mutations together because fruit fly researchers have recently discovered that these genes play similar roles in neurons10-12. PINK1’s protein actually interacts with Parkin’s protein to maintain and protect mitochondria. As a result, a mutation in either PINK1 or Parkin causes mitochondrial defects and increases sensitivity to environmental stress from toxins. The accumulation of damage leads to death in DA neurons and, of course, the resulting impairments in movement as seen in Parkinson’s patients. Further understanding of how PINK1 and Parkin work will allow researchers to develop drugs to compensate for lost function in these genes. 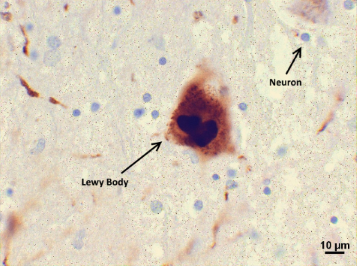 SNCA: Many Parkinson’s patients develop dense masses in their brains called Lewy bodies, which are formed when large molecules called proteins accumulate abnormally and bind to each other. Lewy bodies are primarily made up of the protein alpha-synuclein bound to various other proteins (alpha-synuclein is made from the instructions in the SNCA gene). But why is alpha-synuclein clumping together? Researchers introduced the mutated version of the human SNCA gene in fruit flies and found that mutant flies showed progressive DA neuron death and loss of motor skills, just like the symptoms in human Parkinson’s patients13. And of course, they found clumps of protein. Studies in this fly model are now focused on understanding why the mutated version of alpha-synuclein clump together and cause DA neuron death. Once these questions have been answered, researchers can develop treatments that either prevent formation of Lewy bodies, break them down, or prevent them from damaging neurons. Interestingly, researchers have found that when they add extra normal PINK1 or Parkin protein in this SNCA mutant, the extra PINK1 or Parkin actually helps to protect against DA neuron death14-15. So, another treatment option for Parkinson’s patients with Lewy bodies may be to stimulate extra PINK1 or Parkin protein production as a protective measure. DJ-1: Researchers have found that fruit flies with a mutation in DJ-1β (flies actually have two versions of this gene, and DJ-1β is similar to the human version) are more sensitive to environmental toxins, demonstrating that this gene plays a protective role16. Flies with this mutant gene also showed reduced lifespan and locomotor defects, as seen in Parkinson’s patients17. Finally, mutant DJ-1 protein resulted in abnormal mitochondrial function, suggesting that this gene, like PINK1 and Parkin, is necessary for normal functioning in mitochondria18. LRRK2: Mutations in LRRK2 are likely the most common genetic cause of Parkinson’s disease in humans, but it has so far been the most inconsistent in fruit flies, making it a difficult gene to study. Researchers have performed several kinds of genetic manipulations, including completely knocking-out LRRK2 function, introducing the mutated version of the human gene, or mutating it in a way that changed its function instead of making it completely non-functional. Some researchers found that the mutations led to DA neuron death and severely impaired movement, some researchers found no effect, and others found a result somewhere in the middle19. A few important reliable discoveries have come out of research in this gene, however. First, all of the mutants were more sensitive to various environmental toxins. Second, researchers found that LRRK2 proteins interact with mitochondria, suggesting that it, like PINK1 and Parkin, plays a role in maintaining and/or protecting these structures. These findings support an increasingly convincing conclusion that Parkinson’s disease may be caused by mitochondrial defects or damage that leads to death in DA neurons. Interested in recent Parkinson’s disease research in fruit flies? Check out the Breaking Research post on MUL1.